Our guest editorial this week is by Tracy Robillard, Public Affairs Specialist, for the U-S Army Corps of Engineers. Editor’s Note: This article is the first in a two-part series that discusses the importance of water supply and water quality as congressional purposes for the Savannah River Basin dams and reservoirs. When was the last time you poured a glass of water from the faucet? Do you know where that water came from? If you live near lakes Hartwell, Richard B. Russell or J. Strom Thurmond, chances are your tap water comes from the SavannahRiver Basin. Perhaps the most important function of the Savannah River reservoirs is water supply—providing a source of clean water to sustain human life. 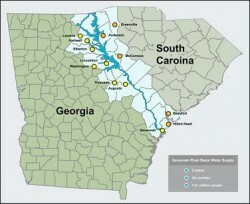 In total, the entire basin supplies drinking water to more than 1.2 million people in Georgia and South Carolina from its headwaters to the estuary. Congress added water supply as an authorized purpose under the Water Supply Act of 1958. This legislation gives communities throughout the SavannahRiver Basin the option to receive water supply allocations from the reservoirs. Currently, the U.S. Army Corps of Engineers has 13 water storage contracts at the three reservoirs. Essentially, these contracts give the purchaser the right to a certain portion of water storage space within the reservoir, according to Melissa Wolf, Corps natural resources specialist. “We don’t sell the water, only the space for storing the water within the reservoir,” Wolf said. To determine the required storage space, Corps water managers calculate a “dependable yield” value, which means that X amount of space within the reservoir will yield Y amount of water, even during the worst-case drought of record, Wolf said. Cities that get their drinking water from the reservoirs include McCormick, S.C.; and Lavonia, Elberton, Washington, Lincolnton, and Thomson, Ga. Other users are HartCounty and Columbia County, Ga., the South Carolina Public Service Authority, the Anderson Regional Joint Water System, and the Savannah Valley Authority.